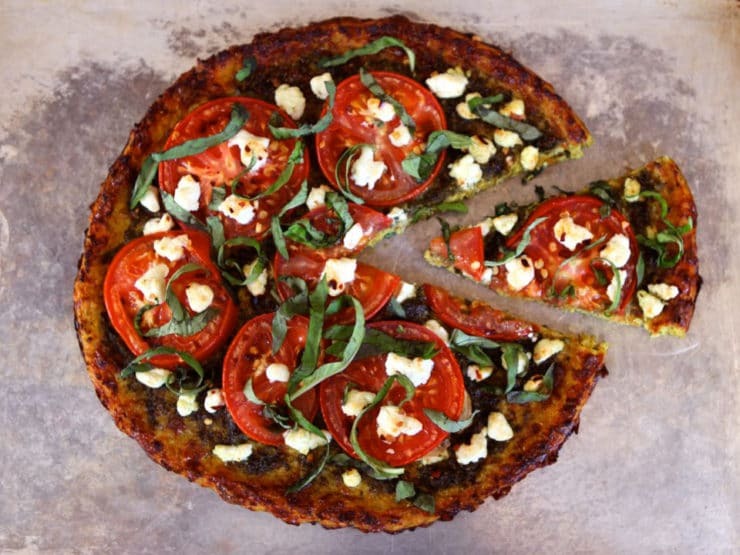 Tomato Pesto Tart with Goat Cheese and Cauliflower Crust – A gluten free, low carb recipe by Tori Avey. Delicious, easy and unique dish. During the Victorian era, cauliflower was more highly regarded than its less expensive cousin, the cabbage plant. As Twain’s somewhat snarky quote suggests, it was viewed as a more refined vegetable. Cauliflower reproduces by seed and is harvested at the bud stage, before it has a chance to blossom. The edible florets are actually made from small, tightly packed buds, sometimes referred to as “curds.” Cauliflower belongs to the species Brassica oleracea, along with cabbage, collard greens, kale, broccoli and Brussels sprouts. Unlike its close relatives, cauliflower is not green. This is a result of the leaves which, if left to grow long enough, cover the entire head, preventing the florets from producing chlorophyll. The resulting white “curds” are a tasty veggie on their own, but they’re also quite adaptable. In recent years chefs and recipe developers have gotten incredibly creative with cauliflower, playing with the texture and using it as a low carb alternative to starchy sides like potatoes, rice and couscous. From soups to salads to gratins, roasted or pickled, cauliflower is a wonder. College education or not, it is certainly one of the most versatile vegetables out there. 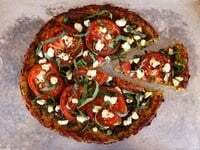 Here, inspired by a delicious Cauliflower Pizza Crust recipe I found on my friend Lori’s blog Recipe Girl, I set out to create a summery tomato tart with a cauliflower crust. This recipe is completely grain and gluten free, but it does contain copious amounts of dairy. It’s a cheese-fest, and it’s divine. The cauliflower bakes together with the spice, cheese and egg to create a tasty base for toppings. Though it’s not like a flour crust– the center is a bit soft and slices are best eaten with a fork than by hand– it provides a solid enough foundation for a bevy of Italian-inspired toppings. The flavor is out of this world. Yes, the cheese is an indulgence, but for those watching their carbs it is a terrific substitute for a crusty flour-based tart. If you like, you can use the “crust” as a base for your favorite pizza toppings like my friend Lori did. Enjoy! 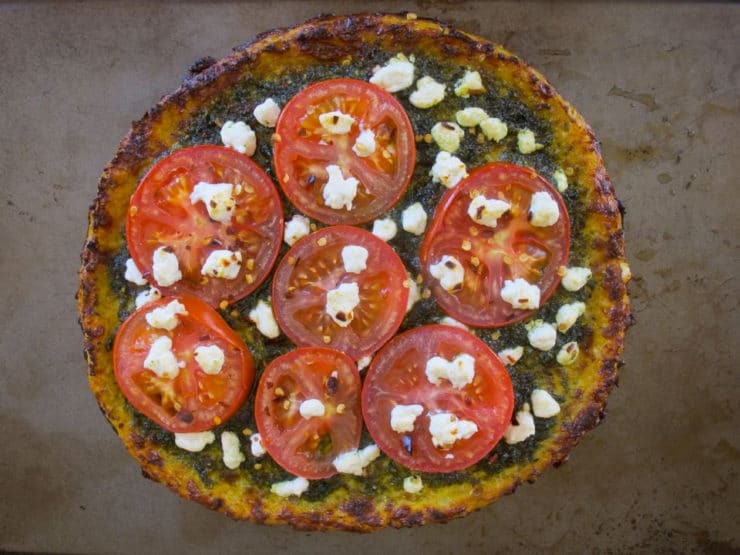 A gluten free, low carb recipe for Tomato Pesto Tart with Basil, Goat Cheese and Cauliflower Crust by Tori Avey. Delicious, easy and unique dish. Preheat oven to 425 degrees F and place a rack in the center of the oven. 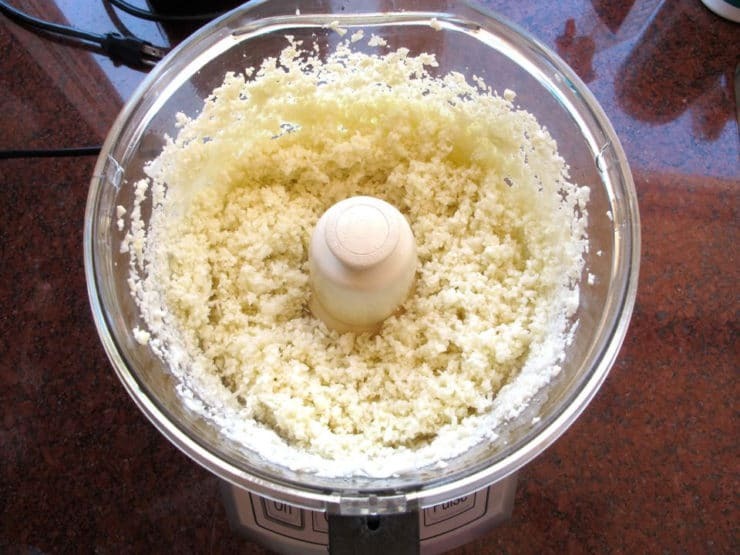 Pulse your cauliflower florets in a food processor until they resemble fine crumbles or couscous (don't over-process to a paste). Alternatively you can hand grate the cauliflower using the fine holes on your grater. 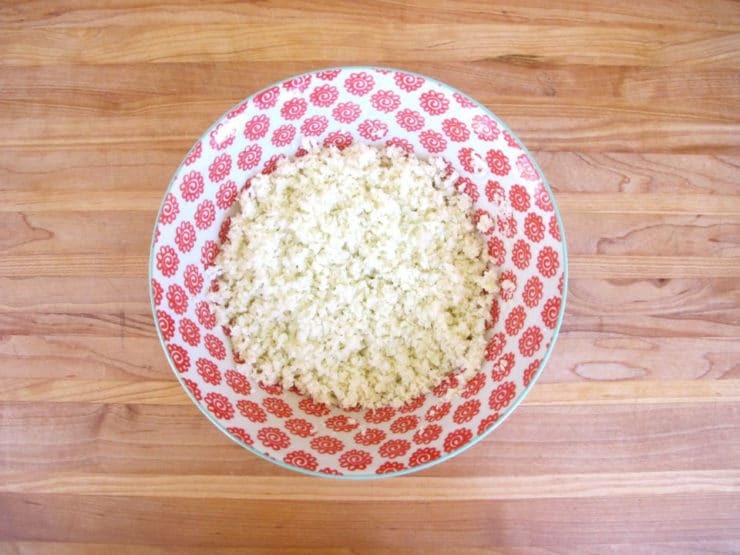 Place the processed cauliflower in a microwave-safe bowl and microwave it on high for 7 minutes. No need to add any liquid, the cauliflower will steam itself. 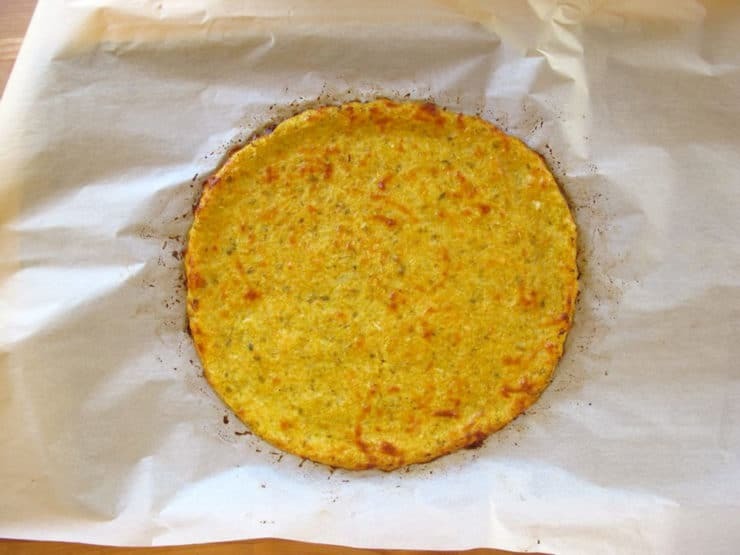 While cauliflower is cooking, line a baking sheet with parchment paper or a silpat. Take the cauliflower out and stir it repeatedly to release steam and cool it down, until it is lukewarm (not hot) to the touch. To the bowl with the cauliflower, add the mozzarella, egg, oregano, minced fresh garlic, turmeric, salt and cayenne pepper. Stir the mixture with a fork until well blended. Place the cauliflower mixture in a pile in the center of the lined baking sheet. 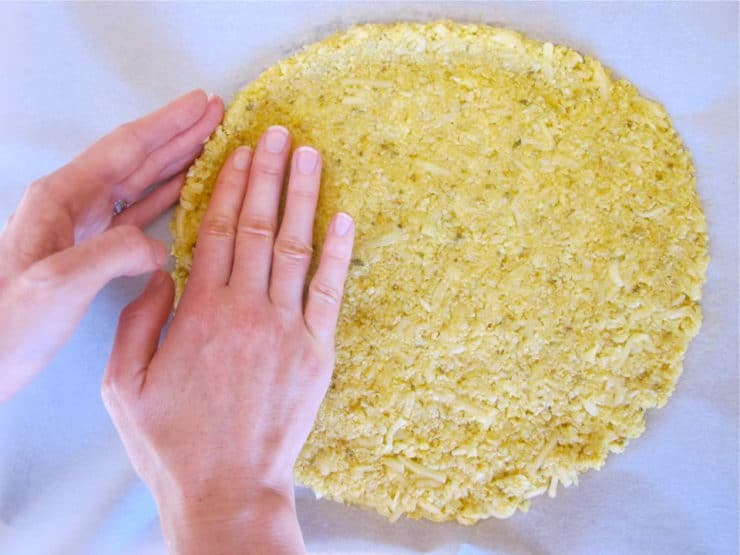 Gently press out the mixture to form a 9-10 inch circle of even thickness, making sure to keep the center as thin as the edges. This is the beginning of your cauliflower "crust." 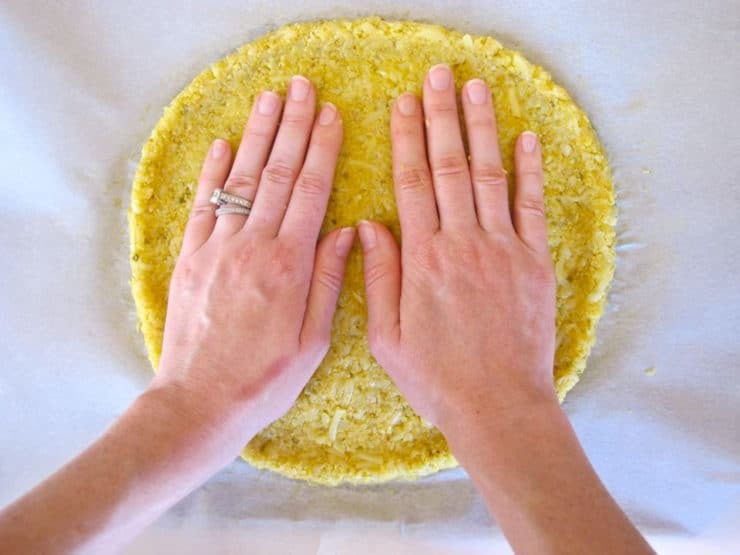 Use your fingers to gently press against the outer edge of the crust to form a small edge around the circle. Lay both hands flat in the center of the circle and GENTLY press to flatten out the middle, ensuring an even thickness throughout the crust. Place the crust into the hot oven and let it bake for about 20 minutes, turning the baking sheet around once halfway through baking, till the crust is golden brown. 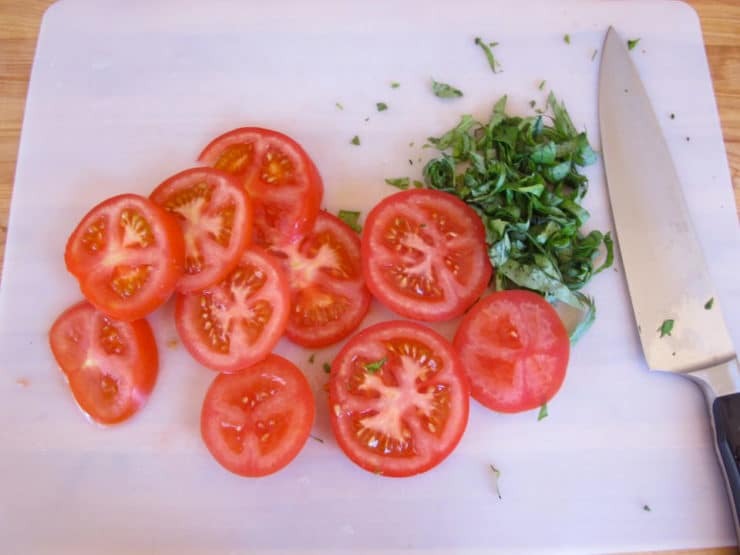 While crust is cooking, slice the tomatoes thin and shred or chiffonade the basil. Remove the crust from the oven and let it cool for 5-10 minutes. 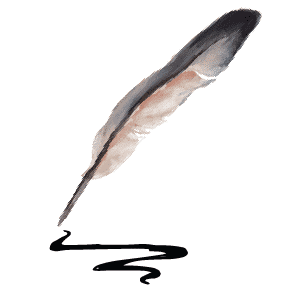 Use a spatula to very gently slide the cooked crust off of the parchment paper directly onto a greased baking sheet. Preheat your oven's broiler. 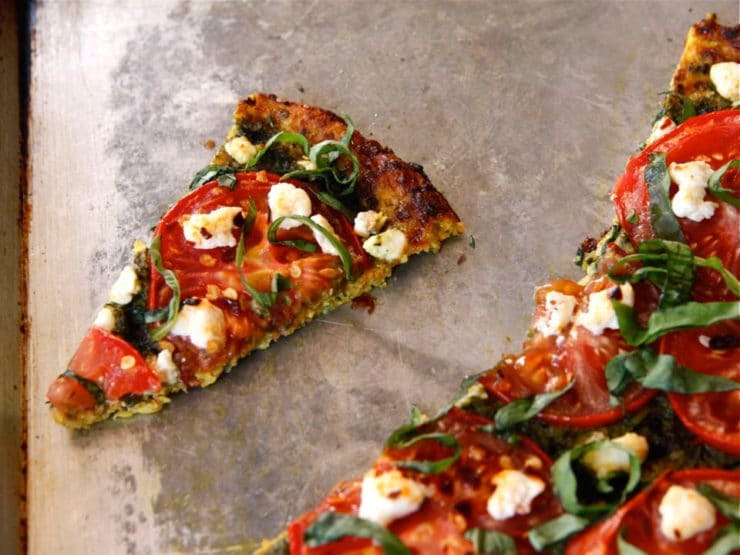 Spread out the pesto onto the center surface of the crust to the outer edges. Sprinkle half of the goat cheese evenly across the top of the pesto. Lay the sliced tomatoes on, then sprinkle the rest of the goat cheese across the top. Sprinkle the surface evenly with crushed red pepper flakes. 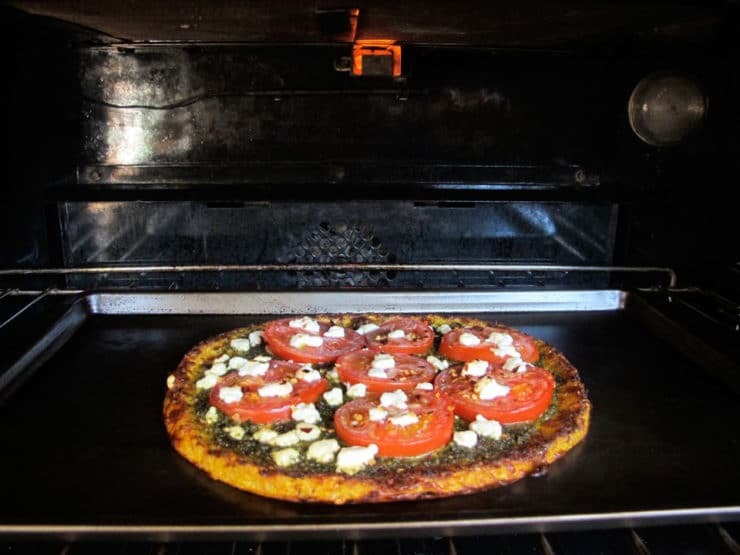 Place the tomato tart into the oven under the broiler. Broil for 3-4 minutes until hot and bubbly, keeping an eye on the crust to make sure it doesn't burn (it will get dark brown but shouldn't blacken). Remove the tart from the oven and sprinkle with fresh basil. Serve sliced warm or at room temperature. Keep in mind that the bottom "crust" of this tart will be slightly soft in the center. Slices are best eaten with a fork and knife. I just made it for lunch today — delicious! Dear Tori, This looks delicious, I would like to try it but I do not have a microwave, do you think I can cook the cauliflower in the oven instead of the microwave? Hi Lola, you could probably roast it on a baking sheet, but you’d have to keep a close eye to make sure the pieces don’t burn because they are so small. Another option would be to steam it on the stovetop in a pot, but you’ll need to get rid of as much excess liquid as possible if you do that by squeezing it in a mesh colander with a kitchen towel. For best results the cauliflower should be as dry as possible. Enjoy! Oh my gosh….every bit as good (and then some) as I had hoped when I first saw the picture and recipe posted. This is so brilliant and innovative and delicious. I am in awe. This is going to be a staple! And thanks for the pesto recipe, too! Yay Nancy! It is definitely on our regular meal rotation now, we love it too. Glad you liked it Joanne! OH MY GOODNESS! That was the BEST pizza EVER! My kids ate their whole thing and wanted another slice. DELICIOUS and totally guilt free. The crust tasted like crust and not like cauliflower which was amazing. I did substitute Feta for the goat cheese, just because I thought the kiddos would enjoy that more. It was very good. I didn’t have any parchment paper, so I just sprayed the pan. It still turned out good, but next time I am going to be sure I have the parchment so it doesn’t stick. Thank you so much for this recipe. I’m gonna share it with my mom. This looks really exciting to try. Two questions. 1. Would the center of the crust crisp up if it were cooked on a rack fitted into the baking sheet? Or is that too much air for it? 2. Have you (or anyone else) tried freezing these after the initial bake? Producing several at once for quick meals later would be really nice. Hi Shay– do you mean a rack directly below the crust, or a rack below the baking sheet? You cannot put a rack directly below the crust, it is too soft at the “dough” stage and would not hold its shape. It only firms up after baking. I have not tried freezing it– it’s a good idea, but I’m not sure how it will turn out due to the cheese in the crust. If you try it will you please report back with your results? Thanks! My crust was crispy on the bottom already! So I don’t think you need to worry too much about that! I don’t know if you could freeze it as a whole pizza, because the tomatoes on top of the pizza would not be any good reheated. But if you wanted to freeze just the crust, that should work. Then just top it and heat it in the oven. The cheese in the crust would freeze well. Sorry I wasn’t clear. I meant after the initial bake–when the goodies are loaded on, but it sounds like it is crisping up enough. And I meant freezing just the crust. I will report back when I play around. Thanks! I am adding this one to my list to make this week 🙂 I’m making my recipe list in advance this week and yours was the first website I stopped on. 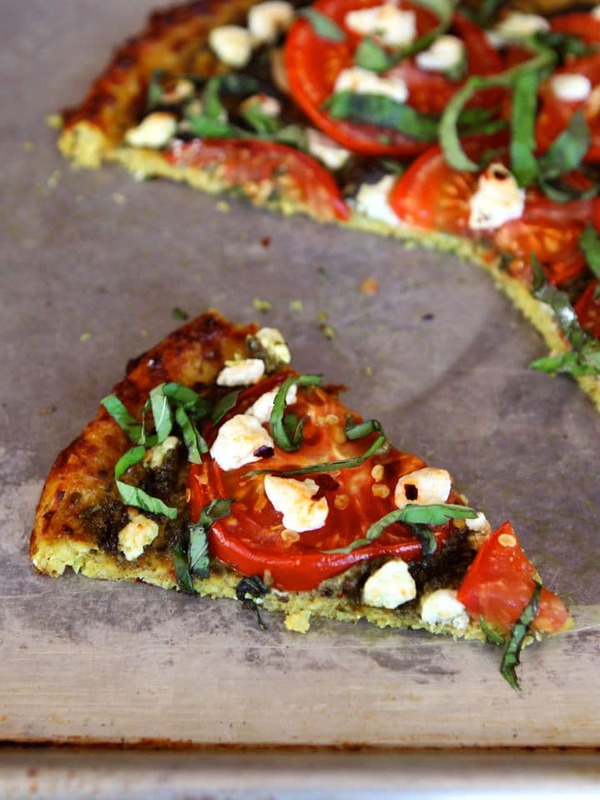 This looks AMAZING and it gluten free! LOVE IT! sounds yummers! I HAVE the ingredients! Thanks Tori. PERFECT for next weeks catering gigs! This looks sooooo good! And I’m not even a pizza lover! Question about goat cheese in general. Is it supposed to have a sharp barnyard after taste? I can’t find good cheese around here regardless, but i have never had good goat cheese. It is supposed to have such a strong flavor after you have swallowed it? Hi Stephanie, all goat cheese has a grassy flavor– I guess you could call it “barnyard”– it’s actually one of the things I like about it. 🙂 Good goat cheese should be creamy, slightly tangy and a little grassy (not overly though). If the grassy flavor doesn’t appeal, feta usually makes an excellent sub. I’ll have to eat it again with an open mind. Although I don’t think I have had good goat cheese. (That is probably the issue!) The kind I tried was not grassy, more like “Goaty” And VERY Strong!! I’ll look for some recommended goat cheese. Do you have a brand that is mild? I love Redwood Hill Farms goat products (their kefir is the best! ), and Whole Foods sells a nice organic goat cheese. I can almost smell and taste it…………gotta make some!! Moosewood Cookbook has a great recipe for zucchini crusted pizza. Please come over and make this for me. 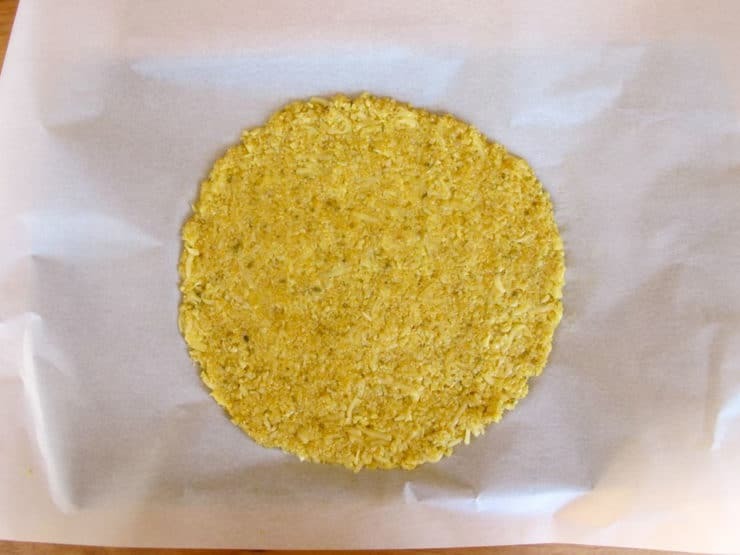 I am a big fan of cauliflower crusts. This one looks fantastic! Can’t wait to try it.